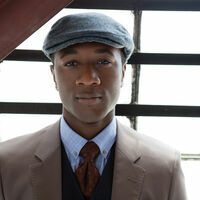 A modern soul singer equally at home belting out dance floor electro anthems or strutting to jazzy hip hop, Aloe Blacc's eclectic range of tastes and influences make him one of the more interesting new pop voices. Born and raised in Los Angeles by Panamanian parents, he grew up playing trumpet before discovering LL Cool J and Run DMC and later started his own hip hop group Emanon with producer Exile in the mid-1990s. Together they released three independent albums of experimental break beats, Dizzy Gillespie samples and socially conscious rhymes, while Blacc completed a degree at the University of Southern California and worked as a business consultant. Penning I Need A Dollar after losing his job during the recession, the track reached Number 2 in the singles chart and was used as the theme tune to HBO television series How To Make It In America; while second album Good Things (2010) made the Top 10 and featured a cover of the Velvet Underground's Femme Fatale. Further success came when he lent his smooth vocals to Avicii's dance hit Wake Me Up, which reached Number 1 in 22 countries and sold over a million copies in the UK alone. I Need a Dollar (Zinc Remix) [Edit]. ℗ 2018 Aloe Blacc Recording, Inc.
℗ 2015 Aloe Blacc Recording, Inc.
℗ 2013 Aloe Blacc Recording, Inc.